Photograph of Eden Gardens, Calcutta from the Album of Miscellaneous views in India taken in the 1860s. Eden Gardens was named after Emily and Fanny Eden, the sisters of the Governor-General, Lord Auckland. 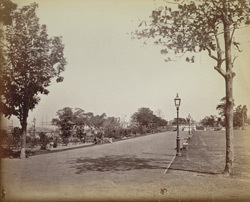 The garden was formally opened in 1840 and is situated in the north-west corner of the Maidan in Calcutta. For many years it was the fashionable evening meeting-place in Calcutta. Today, part of the area is occupied by the Calcutta Stadium.